When I was a little girl, my mom would buy me mini crossed-shoulder messenger bags to carry, because kids could not be trusted to hold onto their purses and not lose it within 5 minutes. Since then, I’ve stayed clear of mini messenger bags, because I thought it was proportionally awkward for adults to carry small bags in such a manner and they reminded me of townies/tourists. But then last year, I noticed one of my friends carrying a very classic brown mini messenger bag across her shoulders, and somehow it looked really good on her- in that charming old school kind of way, which unexpectedly juxtaposed really well with her chic outfits. As always when I first notice something, it then started to appear everywhere. Shopbop now has a whole section devoted to crossed-shoulder messenger bags. The other day, even my friend mentioned to me that she wanted a small crossed-shoulder bag to go partying with, so that she wouldn’t have to worry about her purse while she’s dancing. She was envisioning a small Chanel flap bag, but since it was out of her price range (and it was for clubbing), she wanted to find something cheaper to achieve the same effect. 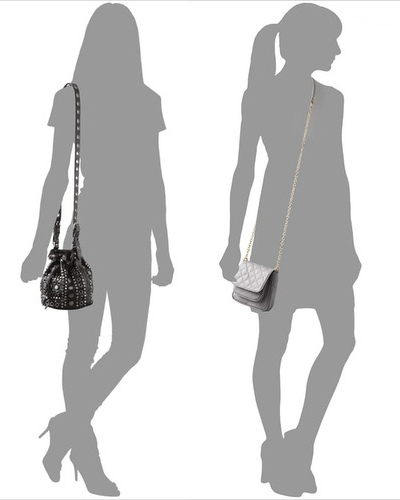 I think these two edgy bags above from Shopbop is an excellent alternative. I’ve often wondered why my mom has so many mini crossed-shoulder messenger Vuitton bags from back in the days. Maybe she had something going on there after all. The trick to not look like a townie or a tourist is to wear these bags with an understated effortlessly chic outfit. Don’t over accessorize, you don’t want to look like you are trying too hard. Admittedly, this look is very hard to achieve. So double check yourself in the mirror before you go out! I love these purses specifically for going out dancing or to dinner. They’re exactly big enough for my phone, id, and some cash, but unlike a clutch there’s no chance of me accidentally putting it down somewhere! I know exactly what you mean by your mom being on to something. My mom has all these cute vintage purses from the 80’s and I wear them everywhere. Her mini messenger bags are COVERED in sequins though, so they’re kinda hard to tone down. These bagsare just so much easier to carry around and have become quite fashionable again, especially for the nightlife active crowd. Can dance while keeping your personal possesions on you. Real Practical Fashion for South Africa where you can’t leave anything lying around without it getting stolen. All those bags are really cute and I like the ones for going out. It’s cool how stuff you thought would never be fashionable EVER again suddenly becomes the hottest thing in stores.